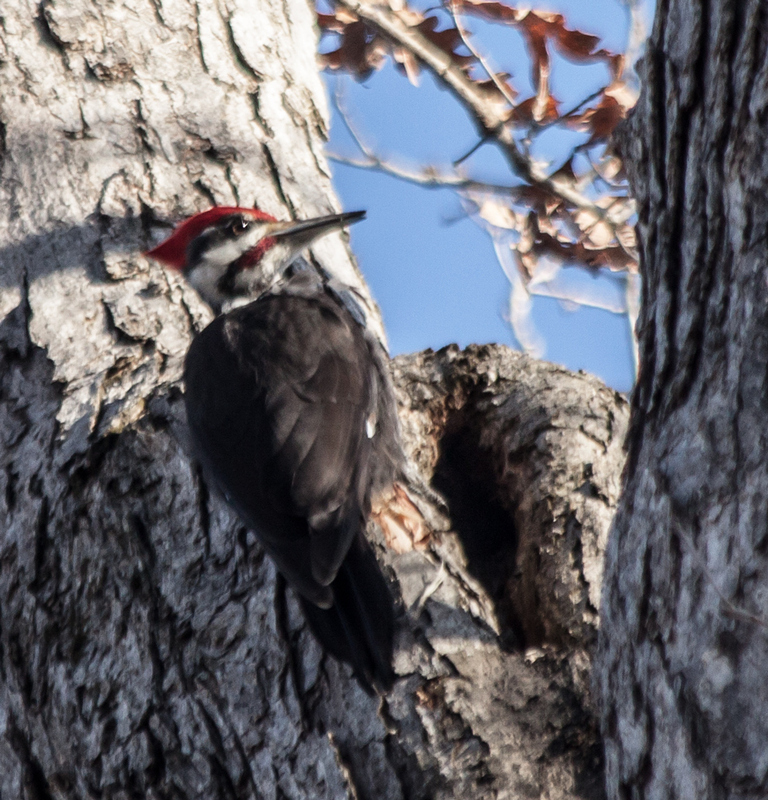 When I accidentally flushed this enormous Pileated Woodpecker (Dryocopus pileatus) last week at Occoquan Bay National Wildlife Refuge, it flew to another tree and tried to hide from me. 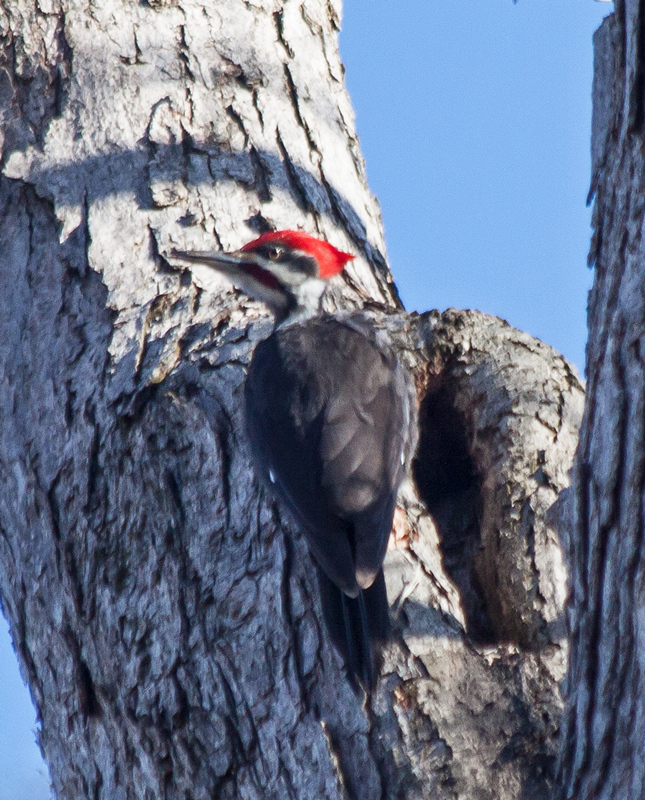 Note to woodpecker—you need to find a much bigger tree if you want to avoid being seen. 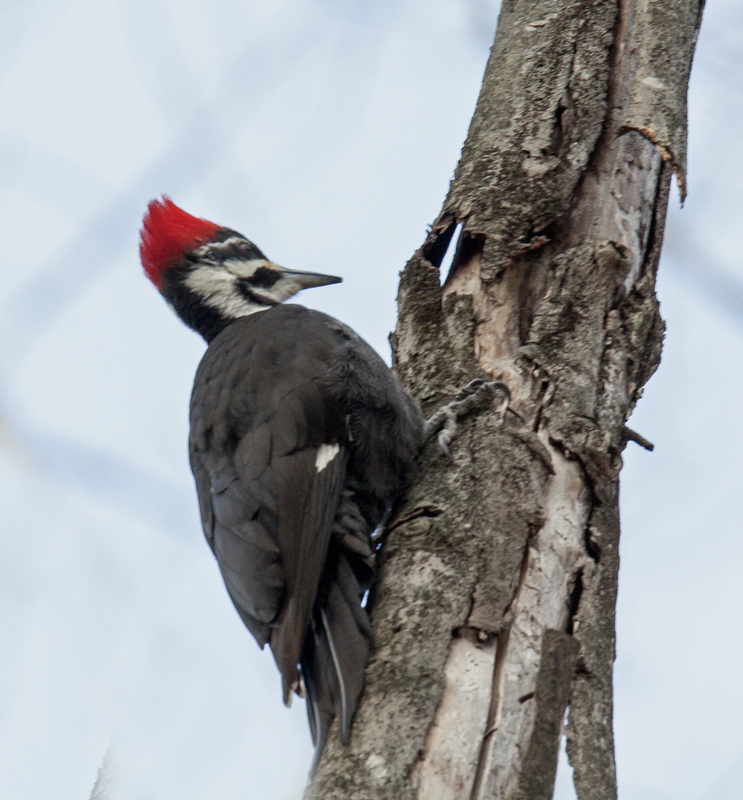 Pileated Woodpeckers (Dryocopus pileatus) are so large and loud that it is hard to miss them when they are around. 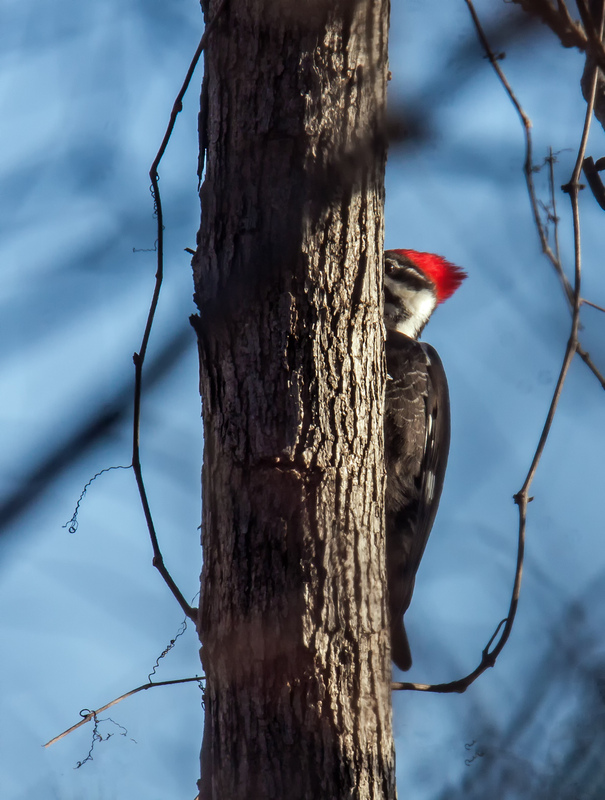 I often hear them from a distance, pecking away at a tree with a volume that seems to match that of a jackhammer, or I catch a glimpse of their bright red heads, but generally they are high in the trees, partially hidden from view behind a tangle of branches. 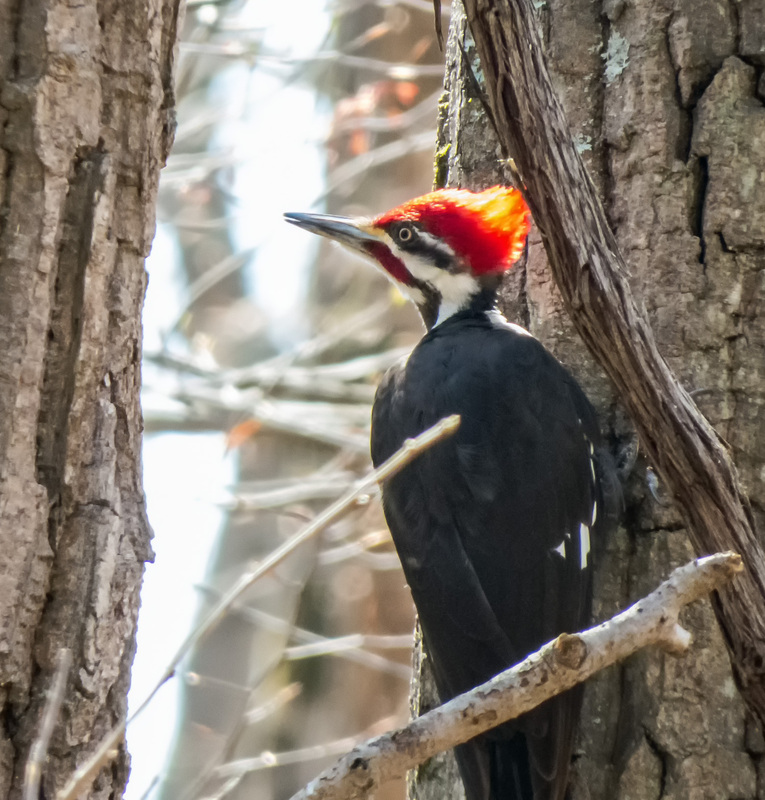 I spotted a Pileated Woodpecker in flight last Friday at Occoquan Bay National Wildlife Refuge and was able to follow it to the tree where it landed. Moving as slowly and stealthily as I could, I tried to find a visual tunnel that would provide an unobstructed view of the the woodpecker. I was mostly successful in doing so and was able a couple of images of the woodpecker at work. I never realized how to determine the gender of these birds, but one of my friends pointed out to me that the red whisker stripes on this bird’s face indicates that this is a male. Although the temperature was 20 degrees (minus 7 degrees C) and the wind was blowing yesterday afternoon, I got fooled into thinking the bright sunshine would warm me up a bit. Most of the creatures at the marsh were absent from view, probably trying to keep warm in sheltered locations. 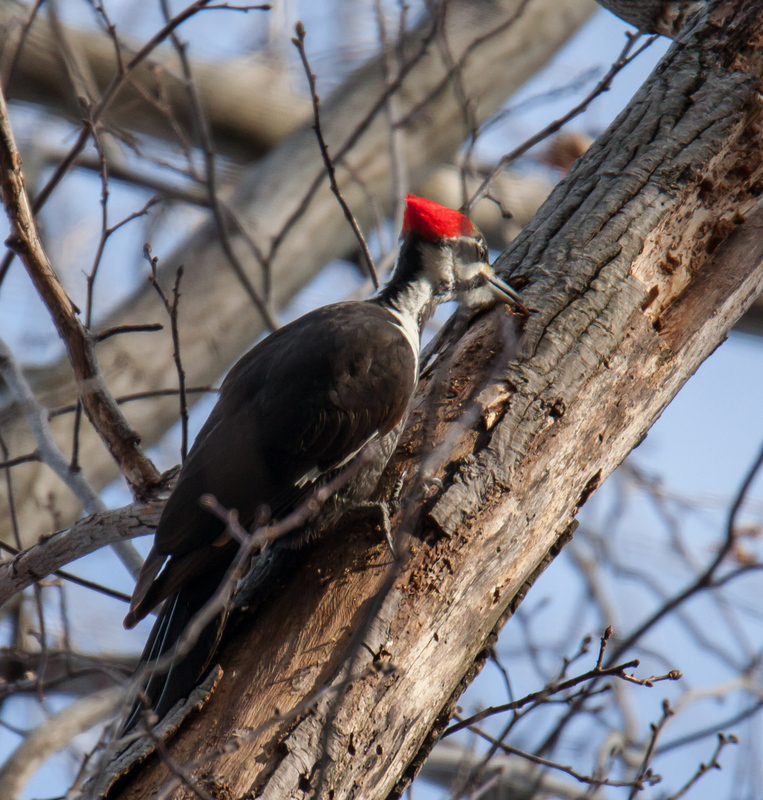 I was excited, therefore, when I head the unmistakable sound of a Pileated Woodpecker (Dryocopus pileatus) at work nearby as I was walking along a path. 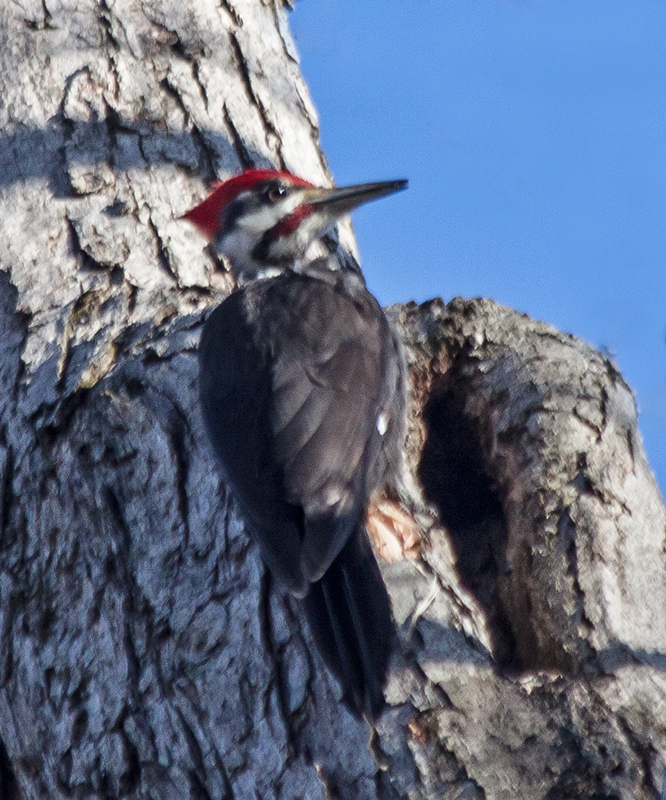 No other woodpeckers in our area can match the volume of a Pileated Woodpecker when it is burying its bill into a tree. I managed to locate the woodpecker and was a little disappointed that it was high in a tree in a location where it was obscured by lots of branches. Eventually the woodpecker climbed higher in the tree and I was able to get a few relatively unobstructed shots, although I had to take them at a pretty sharp angle. 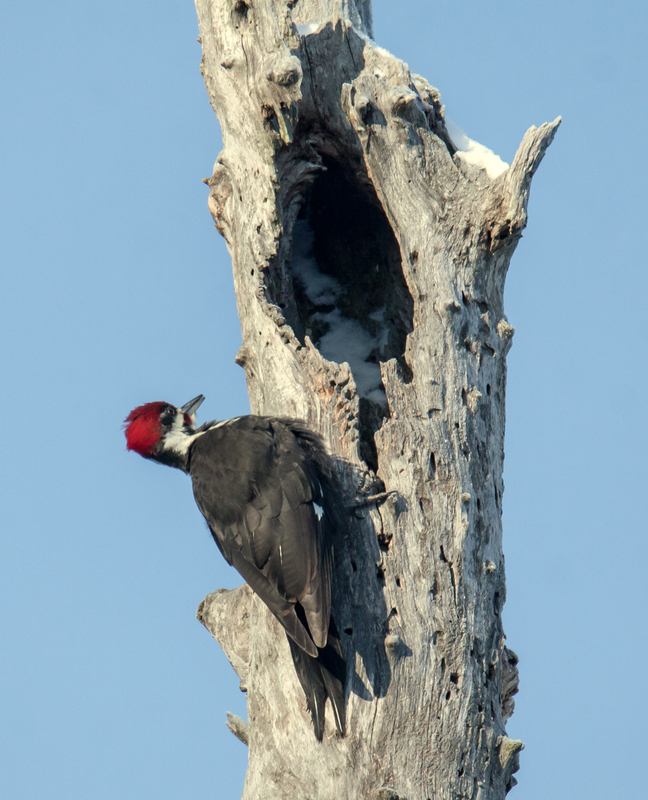 My favorite shot is the one in which the woodpecker looks like it is stalking a prey at the top of the tree. Its eyes are fixed on the target and it seems to be trying to sneak up on it. 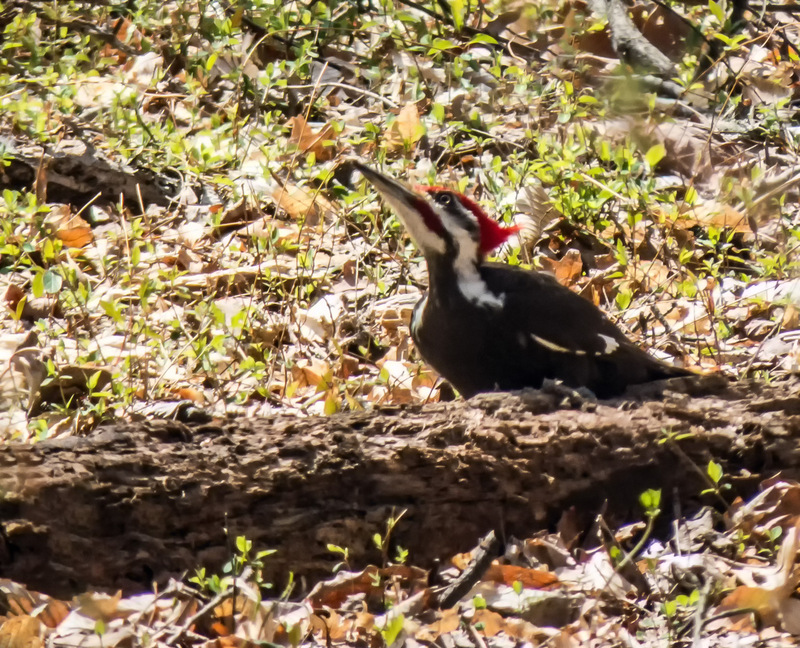 In reality, I have no idea what the woodpecker was doing, but it made for an unusual pose. 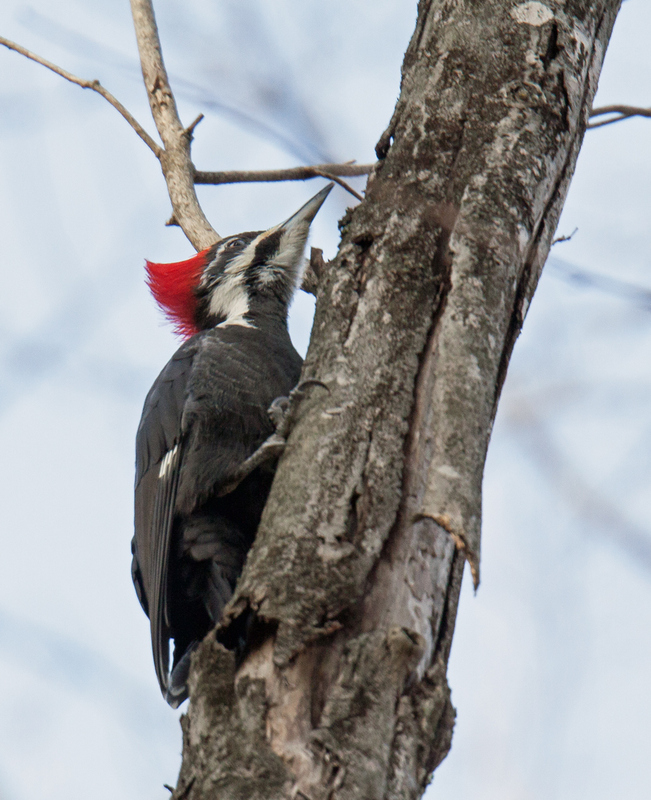 Do woodpeckers ever make noise just for fun? 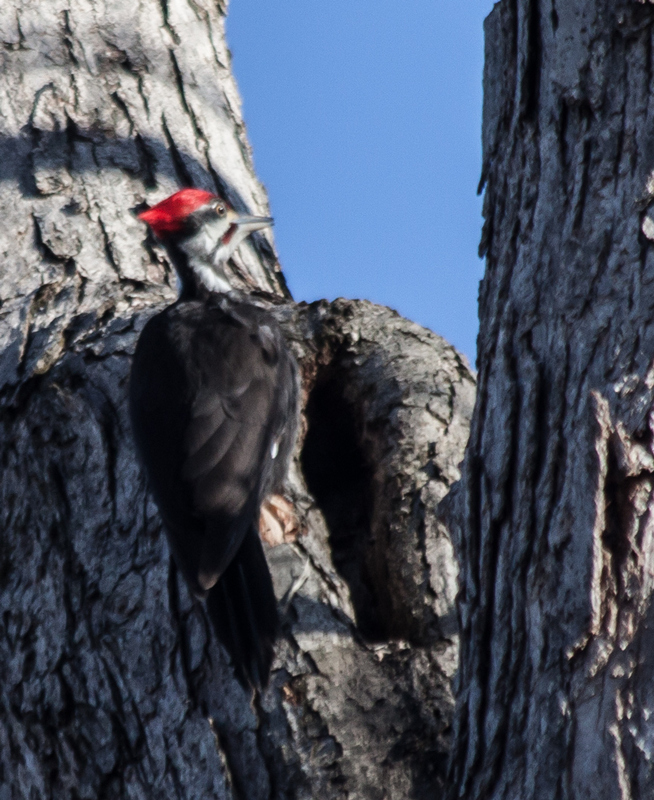 Usually when I hear a Pileated Woodpecker at work, it sounds like a jackhammer as the bird drives its bill deep into the tree, but earlier this week I hear a more resonant, drumming sound coming from a hollow tree. I spotted the Pileated Woodpecker (Dryocopus pileatus) just before it spotted me and I was able to snap only a couple of photos before it flew away. As I looked at the tree afterwards, it was easy to see that it had essentially served as a musical instrument for the bird, allowing the woodpecker to send its rhythmic music out a long distance. What was not clear, however, was whether the actions had been related to searching for insects, because it sure didn’t look like the long dead tree housed any insects. Was the woodpecker sending messages? The message I received was that I should hurry to that spot for a great photos opportunity. Yesterday, I was walking through the woods when I noticed pieces of bark falling through the air. I assumed that this activity was caused by hyperactive squirrels and was shocked when I looked up to see a Pileated Woodpecker high in the trees. 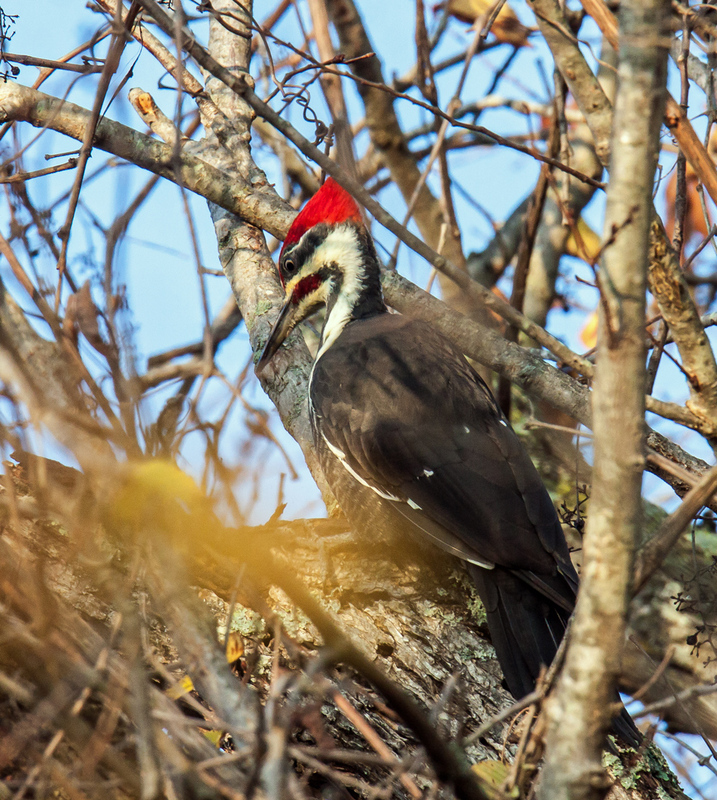 Pileated Woodpeckers (Dryocopus pileatus) are really loud when they are foraging for food and their forceful drumming often sounds like a jackhammer. 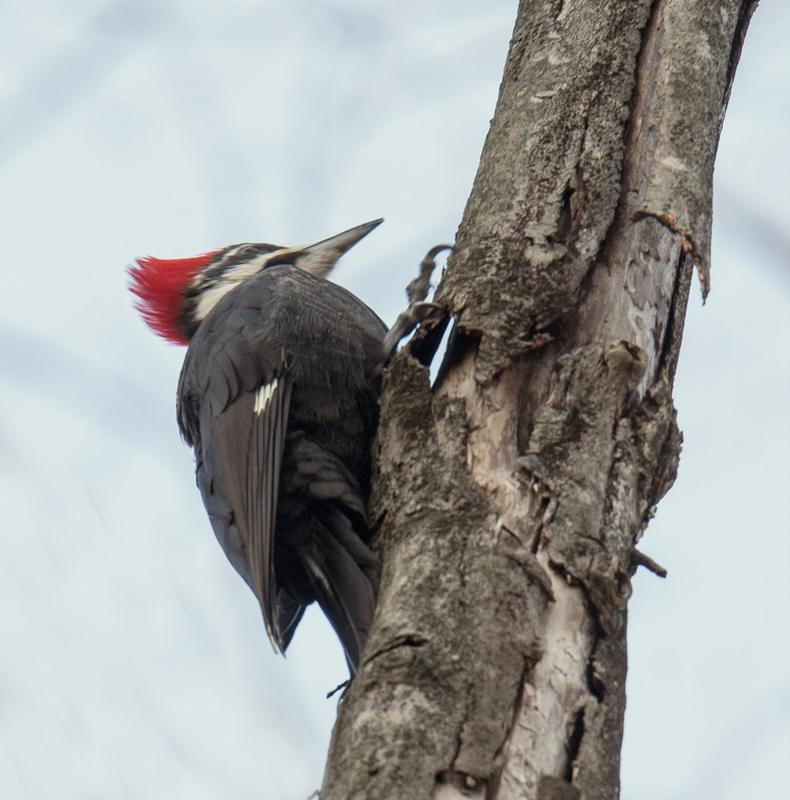 This woodpecker, however, seemed to be in stealth mode and he was removing sections of bark by putting his bill underneath the bark and twisting his head a little. There were quite a few branches between me and the woodpecker, so it was interesting challenge trying to find a visual tunnel that would permit me to photograph him without too many obstructions. As anyone who photographs birds knows well, focusing was also an issue and I ended up with some photos of a blurry woodpecker, but beautifully in-focus branches. I was pretty happy, though, that I managed to get a a couple of relatively clear shots. The woodpecker was undoubtedly searching for something to eat. 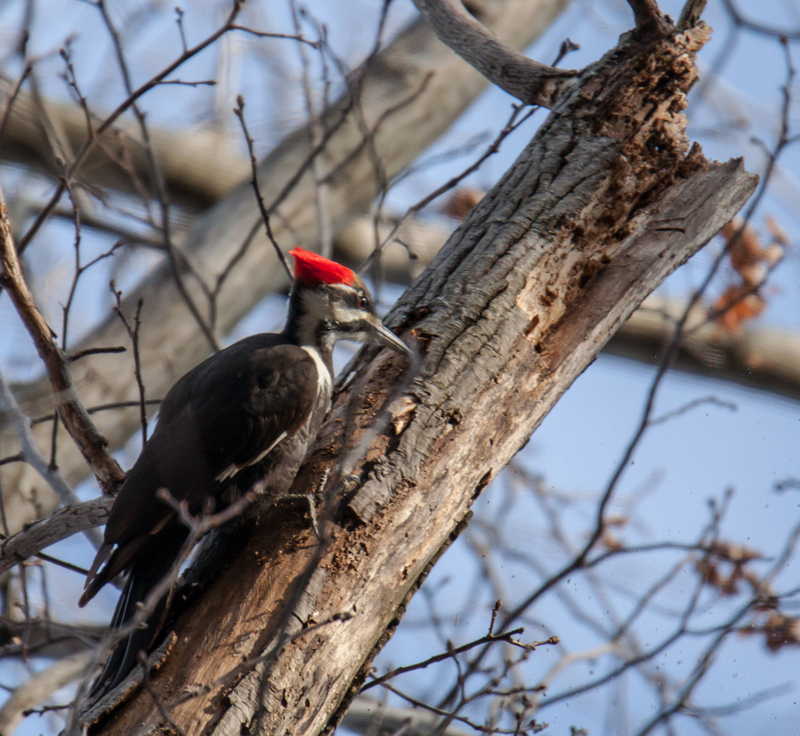 According to the Cornell Lab of Ornithology, a Pileated Woodpecker’s primary food is carpenter ants, supplemented by other ants, woodboring beetle larvae, termites, and other insects such as flies, spruce budworm, caterpillars, cockroaches, and grasshoppers. I have no idea what delicacy this woodpecker was seeking, but in the second photo it looks like he might have found some tasty little snack. Bon appétit! 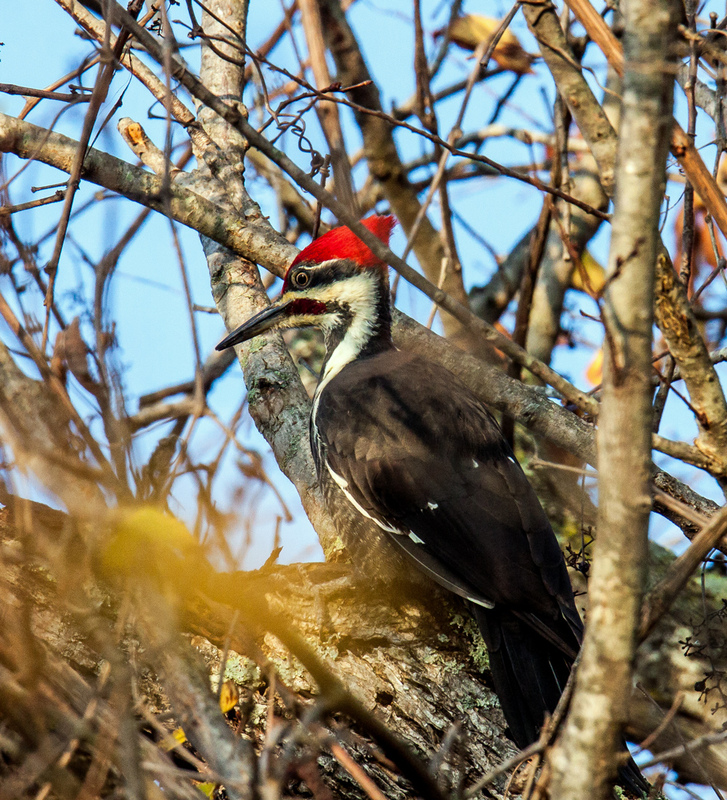 Earlier this month, I spent some time observing a Pileated Woodpecker (Dryocopus pileatus) at work, high in a tree at my local marshland park. The woodpecker would peck away for a while and then stop for a break. As the big bird turned his head to one side or to the other, it seemed to me that its face would light up in a self-satisfied smile.